Perhaps that explains our compatibility on trips...you need the extra time to take a slow-mo GIF of you worshipping a bowl of oatmeal and cup of coffee by the lake in the morning - and I take that extra time to get amp’d up on coffee and a plate of bacon! Without a doubt. Our foibles are complimentary. The thing about sleeping pads is that comfort is only one function. I don't love it, but I can sleep well enough on bare ground. But the other function is insulation, and that's not so easy to do without when the temp is around freezing, as it was that night at Quiet lake. When I crawled into my sleeping bag the night before, it was clear that the pad wasn't holding air, so I trudged back down to the lake with the pad and headlamp. It didn't take long to discover a leak by plunging bits of the pad underwater until the air bubbles appeared, but I was tired and called it quits after finding one, big leak. I plugged it with some gorilla glue and tape, but a slow leak remained. So I was up every hour or so, breathing more air into the deflated pad - too tired to go back down to the lake and look for leaks again. Still, morning was bright, and sleep was good enough. Sipping my coffee in the chill air, enjoying the deep silence, broken periodically by a scolding squirrel or an isolated bird call. So immensely peaceful - and living in a big city with its constant background noises, smart devices, and distractions - moments like this are both rare and restorative. No distractions from the simple fact and intensity of being. I'd be less of a person without these moments. Eventually I packed it in, ready to head out and explore more of the Canol Road. This was some beautiful riding, the kind that seems to stretch on forever because your senses are constantly and fully engaged with your surroundings. With the bright sun the day was warming, and with the several days I had left I was increasingly enthused about carrying on and riding what I've read on others' reports is even more fantastic, the North Canol. But at some point my mind took a different turn. The ride up the South Canol had taken longer than I had hoped, 1pm when I reached its end. Knowing the length of the North Canol I figured I was unlikely to get off of it before late the next day. And there was a little voice in my head that was casting doubt on the idea of continuing on. Ross River is largely a First Nations town. Filling up at the large, industrial above-ground tank, I first went around to the small general store / post office. I bought an energy bar and the woman at the counter directed me to a small shed to pay for the gas. The young man was surrounded by scattered papers and tools, and had no more than a word or two for me as I paid in cash. I walked back to the bike, chewing on the energy bar and sipping water and thinking. My heart wasn't in it. So, I turned back, rode out to the Robert Campbell Highway, and turned east and south. The 230 mile ride to Watson Lake was eventful. Scared up a few porcupines and another ungainly moose who, as I slowed, trotted along in front of me for a quarter mile or so before dodging off into the underbrush. 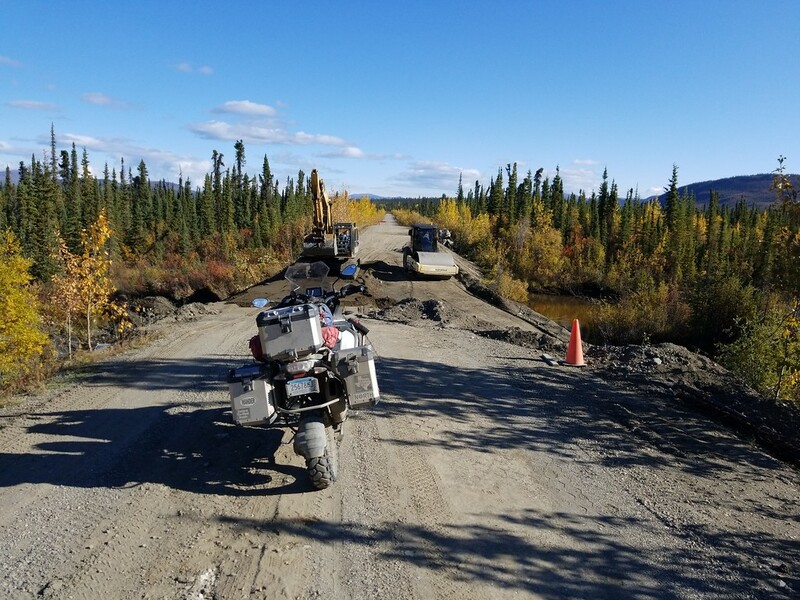 The road width varies without a lot of rhyme or reason, unpaved until 40 miles or so out of Watson Lake, but relatively well maintained and quick. At one point it abruptly stopped with a single orange cone on the precipice of a culvert, where two highway workers were rebuilding the roadway. I got off the bike and watched them gradually smooth out a couple of large piles of fill. After about 15 minutes they had leveled and compacted a track and I eased my way across. But the lack of sleep was catching up with me, and despite plenty of light left in the sky the temperature seemed to be dropping quickly. At one point I got off the bike, added a layer and downed another energy bar, but it didn't seem to help. By the time I hit the pavement, my body was clenched up with the cold, the miles were creeping past, and my vision was narrowing. I rolled up to Andrea's Hotel, and levered myself off the bike. My torso was spasming with shivers and I could barely unstrap my helmet. Two hours later, after laying fully clothed under blankets in my room, eating a hot dinner, and taking a long hot shower, the shivers finally subsided. I had made some bad choices that afternoon. But, as I watched the weather forecast that evening - telling of the Arctic air rushing south and west out of the Northwest Territories - I recognized also that I had made one solid choice in turning south. Halen, knight, Pongo and 1 other person like this. Yes, I believe you did. Eighteen degrees when I woke up the next morning. I discovered that I had picked up a passenger the day before. I had seen a fair bit of wildlife, and I remember some ptarmigan that had been a bit slow to clear the way. I just didn't' realize one had been too slow. Needless to say it was frozen solid when I discovered it plastered to my engine that next morning. Kind of comic. Kind of tragic. I had been thinking to take the Stewart / Cassier back down south, maybe ride a bit of the Icefields again. But turns out that instead I'd be in a race south with the Arctic air. The forecast was for several inches of snow on the highway passes in the Canadian Rockies, so no dice there. It would be colder to the east, but once I got to Fort Nelson the high elevations would be done and less chance of snow and ice. And to my favor, it would be a cold day, but clear and sunny. So after an eggsbacontaters breakfast, it was the Alaska Highway for me. Not too far down I got a sense of the aftermath of the wildfires that had filled the hotels a few weeks prior. The days ride was rich in wildlife. Bison, caribou, purcupine, bighorn sheep all over the place in the higher elevations around Muncho Lake, and a big, fat black bear to wrap it up as I came down and out of the mountains toward Fort Nelson. Canadians are so courteous - they even pull over to the shoulder when they're slowing down traffic. After a lunch at the Northern Rockies Lodge, and I spend some time chatting with the guy overseeing the dining room. He grew up in Ontario, moved to Banff on a lark as a teen and stayed. Worked his way up in hotels, got an accounting degree online, then chucked it at 40 to take up cooking. Now he lives and cooks at Northern Rockies Lodge year-round. We talked about the rigors and pleasures of remote living. His favorite moments revolve around rare midwinter deliveries of fresh fruit. The road past the Lodge follows hard on the banks of Muncho Lake, with great twisties and awesome views. I was worn down - enjoying the ride but bone tired at the end of the day and cold. The temps were hovering just above the freezing point, and only the bright sun had allowed enough of a thaw of the previous night's snows to clear the road around Stone Mountain Provincial Park. But then down from elevation and I was back among pastures and hay bales outside of town. A quick stop for gas and then I holed up at the Motel 6 for the night. Happy again for a warm room. The next days ride would be short. Another cold day, with the temps hovering around freezing, and the monotony of the southern section of the Alaska Highway with its wide, cleared right-of-ways and endless straightaways. A lot more oil and gas development than I recall from six years ago, with periodic man-camps, more traffic, and lots of drilling gear being hauled around for much of the days route. Fort St John in particular seemed "booming." And I closed the last gap in my AK Highway resume. Last time around I had cut west on Hwy 29, just north of Fort St John. I recalled some beautiful farmland and rolling hills along the Peace River, and I'm hoping that they've managed to keep the drilling out of there. In any event, this time I'd ride it through those last forty miles or so to Dawson Creek and the end of the historic highway. I had plenty of days to get home and I couldn't shake the chill with another day of temps around the freezing mark, so I found a nicer hotel and had a big steak dinner to celebrate. Joris van O, Halen, BJMoose and 1 other person like this. Perhaps heated gear should be in your future. I don't quite know the "why" of it, but whether it's the experience itself or the story - the journey home just never seems as interesting. Per my usual schtick, I chose a route back that was mostly new to me. The Arctic air mass had settled in by now, and I would be riding in low temps for the next couple of days. I had several days left of vacation, but a persistent, low-level exhaustion and the cold temps dissuaded me from lingering. That, and the fact that snow in the mountains precluded any travel west for a more scenic ride into the US. Meanwhile, south and east were the Canadian stretch of the Great Plains. More trees than further south, but almost uniformally flat and a preponderance of ag land. Nothing wrong with that, but it makes for some pretty long, monotonous days on a bike. I kept the days relatively short. First day following secondary roads from Dawson Creek over to Edmonton. Again, overcast and the temps never broke 40, and the forecast for the next day was several degrees colder. I woke up the next morning to 33 degrees and steady rain. Hump day. Regina via Saskatoon, and once past Saskatoon I'd be moving into warmer temps. Through the first 80 miles of the day the elevation ticked up almost imperceptibly. As soon as the external temp gauge on the motorcycle dropped to 32, the rain turned slushy and then to snow, and the edges of my windscreen and my visor started to ice up. Snow started accumulating along the grass, then along the edges of the road, and finally into the road itself. I cut speed and found myself striving to keep my arms loose and relaxed as I rode through inch-deep snow and slush at about 45mph. We all reach those moments when we ask whether or not forward is the right choice, and as my discomfort was peaking there was an exit for a small, rural town with a motel. But I was just 100 miles into the day's ride, and I knew that further down the road I'd be riding in 50+ degree temps - a balmy prospect at that moment - so I motored on past that exit. And sure enough, the temps started heading back up shortly after...29...31...32...33... The snow retreated off the road, away from the shoulder and finally disappeared. The temps continued a steady tick up through the day -- 50 degrees when I reached lunch in Saskatoon at an ever-reliable Tim Hortons, and over 60 when I pulled in to the hotel in Regina for the night. The last two days were about what you'd expect from the Plains states. Ever in search of new sights, I took backroads through Saskatchewan, just over the border into Manitoba, across the southern border at Westhope ND, and then across to the north side of Devil's Lake. I stuck with my modest mileage approach and spent my last night in Fargo. The next day a shortish ride home. A week later I had my bike posted for sale on advrider. I was done. The time away from my spouse and home, the disappointment of not reaching Tuk and not pushing through to the North Canol, the miserable experience of being sick on the road, that f**king leaky sleeping pad, and the relentless cold... There are so many things to do with my available leisure time - was that really the way to spend it? The post lingered. One local dude fished a bit for 2-3 weeks. I was optimistic, my wife scoffed, and of course she was right - he wasn't serious. Time spent with a best friend...the bright fall colors...the people you meet and the stories they tell...moose, bighorn sheep, bears...Denali...and those transcendent moments in the wilderness. As @DarkRider has said - no one posting a bike for sale in Minnesota in late September and October is serious - whether or not they realize it. I finally took the post down after about a month. It's not going back up. I've been starting to think about my next trip North. zoid, twowings, joenuclear and 1 other person like this. Nice ending, particularly because this is yet another of those moments (there have been several of them over the past 35yrs of friendship) where I get to point out something rather ironic. @selkins, I ride a 2012 800XC - no cruise...no auto-adjust windscreen...no ride settings...no electric thermometer...heck, and certainly not that BMW-proprietary reach-around feature for long days in the saddle. You, on the other hand, are on a 2015ish 1250GS that's a showroom of electrical gadgetry. And yet you refuse to consider the "witch-craft" of a heated jacket...but please, don't change for me (or rather for your comfort). I need these periodic moments to chuckle and reflect on the irony of your opposition to change. joenuclear, mb289 and selkins like this.